Just weeks shy of his 80th birthday, John Curtis turned the key for the first time to his new condo in late December 2018. Although his plans for his new home were two years in the works, when cancer arrived they suddenly became tentative. Last spring, while he waited for his new condo to be constructed, Curtis started to fall ill.
"I lost about 50 pounds in a matter of a few months without any dieting or anything," Curtis said. One of his sons became very concerned when he also lost a lot of strength, and he took him to the emergency room. The culprit behind the weight and strength loss was eventually given a name: lung cancer, stage 4. 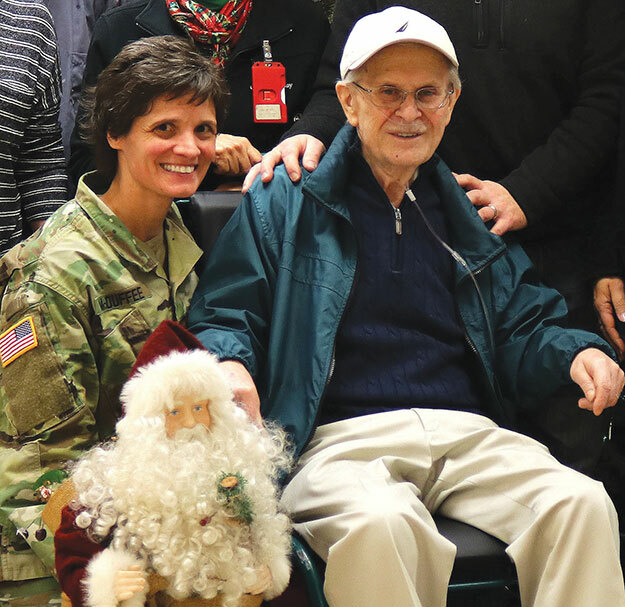 "Now I'm in chemotherapy to see how long I'm going to live," said Curtis, a patient at Madigan Army Medical Center who retired as chief master sergeant from the Air Force. "My prognosis was pretty grim, so I thought to myself, ‘geez, if I'm just going to have maybe a couple, three months left to live, I would like to finish this condo project because I want to leave something behind to my kids.'" His condo on the waterfront of Tacoma not only offers a beautiful view, but also a way to remember his wife, Gisela, who passed away in 2015, and the family memories they made on the waterfront when their sons were small. "I used to own a boat; we used to go out all of the time. We all enjoyed the water," Curtis said. While he dreamed of moving into his new condo, Curtis started to feel pessimistic that his cancer would give him the chance. His new condo building was granted permits to move in tenants as each floor was finished, and he was waiting on his top-floor condo to be completed or for permission to be granted to construct it out of the approved order. It was at a meeting with his Madigan oncologist, Maj. (Dr.) Emily McDuffee, and with palliative care, including Dr. Diane Faran, that Curtis brought up his desire of still moving into his new home. "He told us that getting into this condo was the most important thing, but it wasn't possible," said Faran, a Madigan palliative care consultant. "Dr. McDuffee looked at me, and we knew without words what each other was thinking. We were like, let's just start." Taking a holistic approach to patient care boils down to three questions, said Faran: "Who is this person? What is important? And then the big one -- where our work is -- is what's possible?" "We find out what's important, and then we ask what is possible, and one of the things was getting him into this condo," said McDuffee, Madigan's chief of hematology and oncology. On the afternoon of that Dec. 13, 2018, meeting, McDuffee and Faran found and called Margo Hass Klein with the condo development team for the Baker Condominiums. She called the builder Mike Cohen, and within 90 minutes of their first conversation, Hass Klein shared that the builder could get Curtis into his then-unfinished condo the very next week if the City of Tacoma approved the change of plans and the financing worked out. The next day, they spoke to David Johnson with the City of Tacoma, who made a special exception to update the building permit to allow Curtis to move in ahead of schedule. "We were blown away with how responsive people were. Everyone was like, ‘We're in, we're in, we're in,'" said Faran, who also acknowledged the work of the real estate agent, Larry Tuell. "What we do here as a healthcare team, they did as a new housing development team. Within 24 hours, we had everyone on board." Within a week, the building crew had finished Curtis' condo: putting in trim work, finishing painting, installing appliances and more. The rest of the 8th floor was still unfinished, but Curtis now had a home to move into. "The crew, they dropped everything and went up and finished it; they did it for him," said Hass Klein. "It was so heartwarming; it was incredible." She gives credit to the City of Tacoma for going out of their way to make an exception. "The city didn't have any reason to do this, except that it was a benevolent, wonderful thing to do," said Hass Klein. Curtis has spent the last few weeks slowly moving in; he doesn't have the energy that he used to, but his sons are helping him. He's still thankful for the support from the combined teams to make his goal of living in his new home a reality. "Doctor McDuffee picked it up and decided to start to help me, and it was successful ... she's a gem; she's a real gem," Curtis said. "It got so much positive response. Everybody jumped on the bandwagon to help me out; it was just terrific." For McDuffee, providing this extra advocacy for patients goes beyond even providing holistic care; it fits her philosophy of who she is as a caregiver. "You want to treat people the way you want to be treated, or the way you want your loved ones to be treated ... It's a privilege to walk this journey with people," she said. "You get to know who they are and provide whatever you can for them." Now Curtis' waterfront memories are only an elevator ride and a stroll away. "I'm just very grateful to the Madigan medical staff that was involved in this because I had no idea that they would be so effective in getting this done," said Curtis. "They really made my life a lot easier, because I didn't have a lot of hope, and now I do."